First, Jordan Wolfson. I’d seen images of his work ‘Rasberry Poser’ (2014) online and hadn’t liked the look of it – something about the aesthetic of his cartoon images overlaid on swish, domestic interiors. So I wasn’t excited to see his work, but I really enjoyed searching it out in the McLellan Galleries. The exhibition was very well installed within this historic building. ‘Rasberry Poser’ was my least favourite of his piece, partially because of its slick, sickly aesthetic accompanied by blaring pop music, but also because it has a somewhat sprawling structure. The other exhibited works were much shorter or had a predictable, repetitive structure. 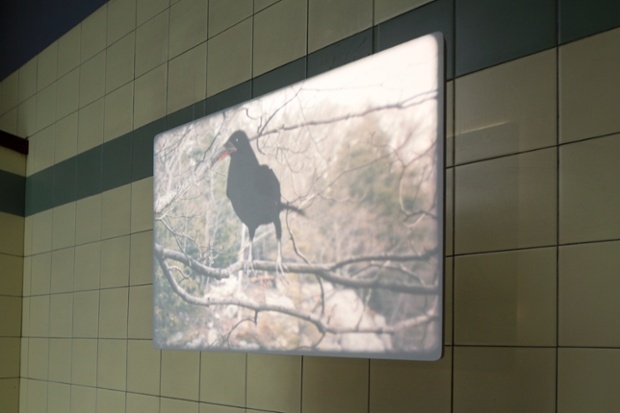 ‘Perfect Lover’ (2007) consisted of a speaking cartoon bird, counting hours, superimposed on a footage of a forest. 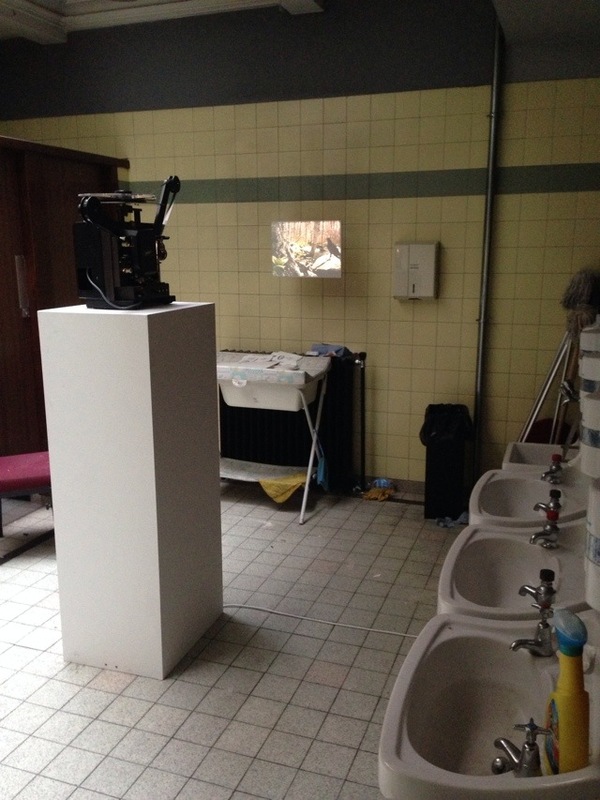 It was installed in the disused ladies toilets and projected at a small scale. 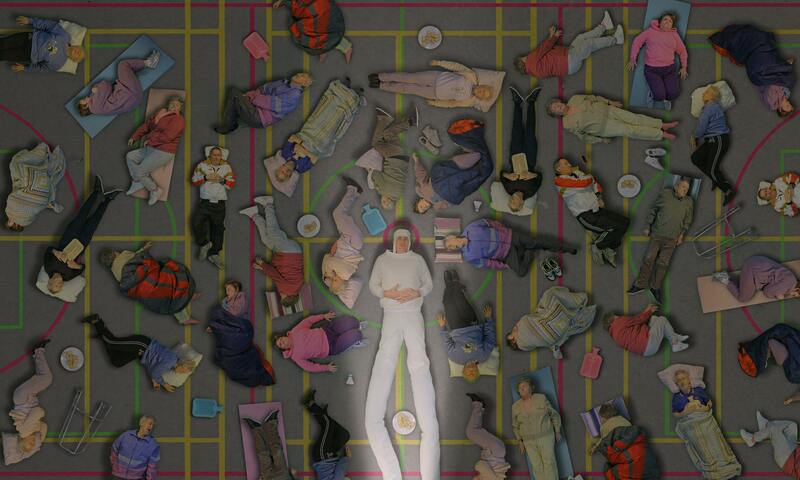 I found this slight, looping film piece amusing and engaging. Perfect Lover by Jordan Wolfson, 2007. Image: Alan McAteer from The Guardian, http://www.theguardian.com/artanddesign/2014/apr/07/glasgow-international-festival-art. Contrasting ‘Perfect Lover’, an Untitled work from 2012 was projected large scale on a freestanding screen. It showed slowed down footage of a hand manipulating a decorated claw (a lobster claw I think), reminiscent of painted sea shells and Victoriana curiosities. The claw is bound by a ribbon and at first the image printed on it is obscured by a hand that moves in and slowly cuts the ribbon. When the ribbon is cut and the hand withdraws it shows a pornographic image of a naked young man. Then the whole cycle begins again with a different but similar claw, so perhaps if I had stayed long enough there would be a whole series of claws. What appealed to me about this work was the incongruity of the object and the action, which was quite meditative to watch. So it seemed both quite aggressive and gentle at once and could be taken as a metaphor for breaking something, for literally penetrating or for figuratively doing so in terms of breaking a taboo. Upstairs in the same building I encountered the work of Charlotte Prodger. She was showing a whole-room installation, interesting in terms of its display. It included a narrated sound work, also presented as a transcribed text, that acted as the soundtrack for images and footage shown on 3 monitors. Facing in different directions, you had to walk around the room to watch the different sections/images as they came on screen. However, in terms of artwork content, the piece of Prodger’s work that interested me most was displayed more subtly on a single, small monitor in the gallery’s landing area. It was a work called ‘Compression Fern Face.’ On screen a rotating geometric shape and alongside this an audio narrative recounts video/performance work by an artist referred to as “D.O.” The narrative describes a series of videos, as if watching them, although I presume the artist and videos are fictional. The work described is reminiscent of that by artists such as Vito Acconci and Dan Burden, produced in 70s. Some of them involved squashing ferns into different body parts. I found it funny in a dead-pan way. (Update: since writing the above I’ve discovered that D.O. is Dennis Oppenheim and the video refers to actual works he did, somehow this didn’t click, even though I’ve only recently seen his work at the Henry Moore Institute). So, now to my favourite venue of the whole festival, Tramway. The gallery was showing two brilliant exhibitions by Bedwyr Williams and Micahel Smith. Williams’ ‘Echt’ was an absolute joy to watch, very exuberant and visceral and good fun whilst being simultaneously incredibly dark and close to the bone. A dystopian fantasy tells of a society where social order has broken down and the people now in charge are those who have hoarded the most stuff. They ‘rule’ their inferiors from abandoned club/discotheque buildings with aggressive bouncers who have over developed facial muscles (from face building as opposed to body building). There was so much going on within the work that it’s hard to summarise but I was particularly taken by the idea and visual representation of the new ‘kings’ and ‘queens’ who show their status by wearing layers and layers of clothing – stacks of cardigans making them hunch backed, caps piled high on their heads. I also can’t shake the image of former councillors and property developers being walled up to die in model bungalow sarcophagi with their heads still visible through mini conservatories. 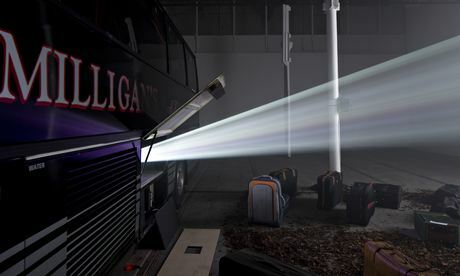 The eerie atmosphere of the work was compounded by its display within a large, dark gallery space entered via a tree lined path but then empty save for the projection and an apparently abandoned coach with its baggage strewn out across the floor. Echt by Bedwyr Williams, 2014Image: Alan McAteer from The Guardian, http://www.theguardian.com/artanddesign/2014/apr/07/glasgow-international-festival-art. There’s similarly a lot to say about Michael Smith’s work. There was probably about 8 separate video pieces being screened as part of his exhibition, spanning his career. So I’ll just write about my favourite. A newish work, I think, although I cannot find the title/details of it now. It showed the artist in multi-pocketed coats, repeatedly taking items (phone, wallet, glasses, sunglasses) from the pockets, fiddling with them, rearranging them, returning them. He looked perpetually anxious and I have to say it resonated with how I sometimes feel doing a wallet/phone/keys/train ticket check between the various pockets in my coat and bag. Smith is an artist who I didn’t know about before and I’m really pleased to have made the acquaintance of his work. Just to give you a little bit more of a taster, other videos involved disco dancing and ghosts. What more could you want? !